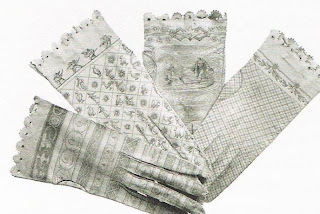 It's unusual to find truly antique fashion pieces that also seem absolutely wearable today, but here's some I think are great: these gloves from the Directoire period (post-Revolutionary France, characterized by a restrained, classical style heavily influenced by Ancient Rome and Pompeii). They're made of calf or kidskin, and have been printed with motifs typical of the period. They'd be perfect with an otherwise simple white or black suit. I've never seen their like in any vintage shops or on eBay--this seems to spell opportunity for a glovemaker (or fashion student) to do something truly special.